Goliath--The leader of the NYC clan. Goliath is a proud, noble warrior who does not like to have his orders questioned. He holds himself responsible for the protection of the entire clan, and fiercly blames himself if anything happens to any of the members. Goliath was once in love with Demona, and still feels a twinge of sadness along with his current hatred and mistrust toward her. He has very strong feelings for Elisa, and is Angela's father. Hudson--Former leader of the NYC clan. The oldest member of the clan, his chief figures are his long, gray beard and the scar over his left eye (which was destroyed in battle). He is a proud warrior who still tries to observe the old ways. Hudson was illeterate for a long time, but is now learning to read. He loves to watch television, and has gained incredible wisdom and patience over his years. Brooklyn--Goliath's second-in-command, this fire-red gargoyle is the cool dude of the clan. He loves to make wisecracks and joke around, but is more than ready when it is time for him to take charge. He sports the greatest hatred for Demona of anyone in the clan, and has ever since Demona tricked him into helping to turn Goliath into a mindless slave. If anyone has a smart remark for a situation, you can bet it will be him. Broadway--Broadway's true passion is food, as can easily be seen by his enormous stomach. Broadway has a heart of gold, though. He enjoys watching movies, and has a special hatred of guns, after accidently shooting and critically injuring Elisa. He is also illeterate, but is learning to read. Broadway and Angela have fallen in love over the course of the show. Lexington--The youngest of the clan affected by the spell, Lexington is fun-loving and enthusiastic about all things. He is a whiz at anything technical, and is the one who is called upon to solve problems the rest of the clan faces with machines. Lexington once proved his technical prowess when he built a motorcycle out of used parts (it was unfortunatly destroyed by a stray bullet). Bronx--This deep purple quadraped gargoyle is the clan's watchdog. He cannot speak and has no wings, but has saved the lives of clanmembers on numerous occasions. He is fiercely devoted to those he cares about, and is willing to lay down his life to protect them. Angela--Raised on Avalon, Angela joined the rest of the clan in NYC only recently. She is the daughter of Goliath and Demona, and has the most forgiveness of anyone for her mother. She is in love with Broadway. 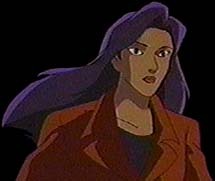 Elisa Maza--An NYPD detective, Elisa discovered the gargoyles accidently while investigating Xanatos' doings. 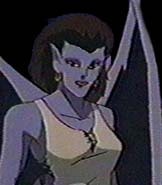 She formed a deep friendship with all of the gargoyles, especially Goliath. Her father is on the police force, as was her brother before he was mutated into a gargoyle-like creature called Talon. Her mother is a missionary in Africa. David Xanatos--An eccentric billionaire, he is responsible for moving Castle Wyvern to the top of his skyscraper (and above the clouds), thus breaking the spell. Although he started out with evil intents, he has changed his ways(?) ever since the clan saved his son Alex from being taken to Avalon by Lord Oberon. He now allows the gargoyles to live in Castle Wyvern again, and they have a shakey alliance. His fourtune was started by an ancient coin that he sent himself from the past with the help of the Phoenix Gate. Xanatos was a rather menial member of a secret criminal organization known as the Illuminate. Whether or not he is still a member is unknown. Demona--Goliath's former second-in-command, she betrayed the humans they were sworn to protect to the Vikings in the tenth century. The Vikings then shattered the statues of nearly all of the clan. Since then, she has harbored an intense hatred toward all humans. She was made immortal by the Wierd Sisters, unless killed by MacBeth. Later Puck made her turn into a human by day instead of into stone. 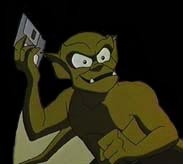 Owen Burnett/Puck--Xanatos' most loyal servant. When Xanatos needed a test subject for an immortality brew, Owen immediatly plunged his hand in. It was turned to stone. 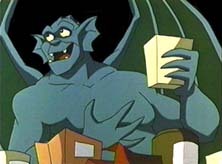 Owen later revealed to Xanatos that he is really Puck, a mythical child of Oberon, in human guise. Puck was interested in Queen Titania's decision to disguise herself as a human, so he tried it. In order to amuse himself, he decided to imatate and outdo Preston Vogel, Halcyon Renard's rather stuffy assistant. Upon revealing his true self, Puck offered Xanatos the choice of one wish or a lifetime of service by Owen. 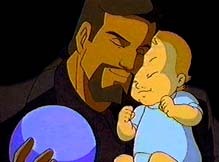 Xanatos chose Owen. Puck was so impressed that he honored the agreement. Puck was instrumental in saving Alex from Oberon, and was thus stripped of his powers unless they are used for the protection or education of the child. He was also forever banished from Avalon. Matt Bluestone--Elisa's new partner, he is obsessed with exposing the Illuminate. 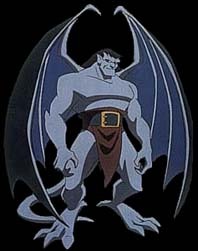 He recently learned about the existance of the gargoyles, and has teamed up with them from time to time. 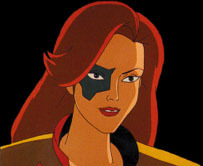 Fox Xanatos--Born Janine Renard, Fox is the former leader of a criminal gang known as The Pack and is now David Xanatos' wife and Alex's mother. She is half fay, being the daughter of Halcyon Renard (owner of CyberBiotics) and Queen Titania, wife of Lord Oberon (who was in mortal guise when Fox was concieved). Alexander Xanatos--This child possesses the potential for great magic. He is currently being instructed in its use by Puck.